President Muhammadu Buhari has approved the extension of tenure of the Chief of Defence Staff, General Gabriel Abayomi Olonisakin by one year. 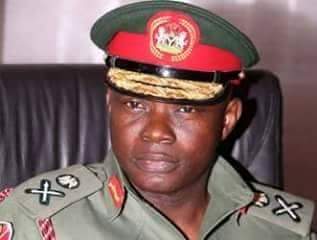 Vanguard investigation showed that Buhari’s decision to extend the tenure of the CDS which would have ended this weekend, was due to political maneuverings by vested interest who want to ensure that the two most powerful positions in the Military, that of the CDS and that of the Chief of Army Staff, remain in the core north. It was further gathered that before the President order that General Olonisakin’s tenure be extended by one year, the CDS had commenced the gradual evacuation of his personal effect and belongings from the office. Gen Olonisakin CDS had no inkling that the tenure would be extended even though Mr President can decide on such extension as provided for in Law. The CDS, who was the Commandant of the Training and Doctrine Command (TRADOC) of the Nigerian Army in Niger State before his appointment, was at one time, the Commander, Nigerian Army Signals Corp and also served as the Principal General Staff Officer to a former Defence Minister among several other appointments. A presidency source who confirmed the development to reliable source said the action of Mr. President has shown divine intervention in the affairs of men. Noting that some had already concluded how offices in the military will be shared, forgetting that promotions and appointments have God's backing. Recall that early this month, the Defence minister issued a statement debunking media reports that the Chief of Defence Staff, General Abayomi Olonisakin has been retired and that his position has been handed over to the Chief of Air staff, Air Marshal Sadique Abubakar. The statement said, “The attention of the of the Minister of defence, Mansur Mohammad Dan Ali was drawn to some media publication claiming that he has sent letters to the Chief of Defence staff, General Abayomi Olnisakin and the Chief of the Naval Staff, Vice Admiral Ibok Ibas directing them to hand over their offices on or before Friday December 16, 2016. “Please be informed that there was no such communication between the office of the minister of Defence and the service chiefs directing any one of them to hand over his office and proceed on retirement. “The appointment and replacement of service chiefs is a prerogative responsibility of the office of the President and Commander in Chief”, the minister said.